Sure, Dallas has some fantastic museums and a spectacular skyline. The city is pretty underrated in the foodie department, too, boasting a few truly exceptional restaurants that the masses have yet to discover. But it is the local bar and nightlife scene that will convince you to never leave town. Whether you’re looking for a dog-friendly patio where the beer is cold and the company is laid back or you’re in the mood to glam up and be seen in one of the most historic hotel bars in the city, the best bars in Dallas always deliver. Looking to step up your swank for a night? Mansion Bar, tucked away inside the Rosewood Mansion Hotel, is the place where you could imagine Tolstoy writing out a timeless novel on a bar napkin. Dark wood and leather-lined walls decorated with equestrian art and clear casks filled with amber liquors set the tone. This is classic chic meets southern charm. Voted one of the best Dallas happy hours, choose a weeknight, slip into something that doesn’t go in the dryer, grab a corner table and sip on a half-price creative cocktail like the beetlejuice: made with roxor gin, strawberries, beets and balsamic. Let’s talk dive bars. Lee Harvey’s checks everything on the list: neon signs, cheap wood paneling, torn pleather booths and a raggedy pool table. Despite the infamous namesake, Lee Harvey’s is one of the weirdest, most welcoming joints in Dallas. Take advantage of cheap but stiff bar offerings and bring your dog to plop on the patio for an evening to drink and enjoy free jukebox beats. Stop by on Mondays for $1 tacos. Perfect for groups, singles or just a random night on the town, Round-Up Saloon and Dance Hall in Oak Lawn is one of the best LGBTQ, western-themed bars in Dallas, offering stiff drinks, spectacular line dancing and inspired karaoke performances. With six bars to choose from and a massive dance floor, it’ll be your most favorite and (probably) only bar stop for the night. It doesn’t get more Texas than a bartender slinging drinks from an AirStream parked on a patch of dirt surrounded by a smattering of truck-bed tables. This open-air bar in lower Greenville is the perfect spot for, well, anything. Choose from a variety of rotating food trucks and three stationary bars serving very interesting drinks like trash can punch, made with New Amsterdam vodka and “other good stuff.” This is the place to be when temperatures climb to the unbearable triple digits, so get here early to snag a spot and catch some live music. There are upscale bars, and then there is the The Library Bar. One of Dallas’ most iconic and historic drinking establishments, this uptown gem lands itself on nearly every “best bar” list for good reason. Half off wine and cocktails Sunday through Thursday means a little live music and fancy sips without too much damage to your wallet. It’s the perfect spot for quiet conversation against an elegant piano and timeless mid-century decor backdrop. The ultimate “come as you are” bar welcomes the glitzed up, tipsy spillover guests from Knox Henderson to mingle with the “I’ve been here since happy hour” goers on an enormous patio with a life-size jenga. With more than 21 beers on draft and one of the best happy hours in Dallas, you won’t even mind the slightly gimmicky pin-up decor. Wine Wednesdays were begging for an upgrade. Along came Sixy Vines. A growing trend that’s fairly new to Dallas, nearly 40 types of wine on tap allow for the perfect temperature, minimal oxidation and—most importantly—a cork-free experience. 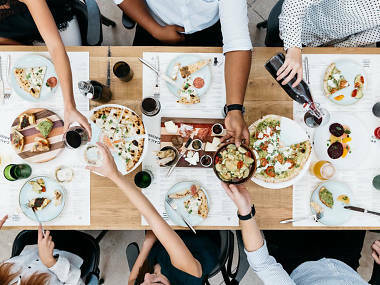 Located in Plano and Uptown, the Sixty Vines focus is simple: good wine on tap and straight-forward, delicious food made for sharing. Looking to upgrade your wino status? Join the Vine Hugger Club and get to sample custom-made wines made specifically for Sixty Vines. Upscale and relaxing don’t usually mesh, but this historic landmark turned cozy cocktail lounge is just that. Right off the well-beaten path of McKinney Avenue, Bowen House offers can’t-beat $5 happy hour mules and Negronis. For something a little more unique, head to the mezcaleria in the back room, where you choose a spirit and flavor profile, and let the bartender do the rest. Marble counters, comfy booths, a fireplace: it’s a recipe for a perfect night of conversation and camaraderie. Feel like a million bucks without spending it at the rooftop pool and bar of the 2016-renovated Adolphus hotel in downtown. Although normally only accessible with a room key, this seventh-story hangout is now open to the public every Friday night during the summer for “Sundown at Seven.” Sip on discounted Mai Tais in a secluded cabana or float with friends past the poolside DJ. New doesn’t always mean good, unless you’re talking about Hide: Deep Ellum’s newest cocktail bar. Hide is like a secret laboratory for simple, unpretentious but boldly flavored drinks. Most of the concoctions are made using centrifuges, roto-vaporizers and a host of complicated gadgets. Don’t let the molecular mixology intimidate you, though; Hide doesn’t take itself too seriously with offerings like “yass betch,” made with vodka, mint, cucumber, honeydew and clarified lime. Unlike the dark, windowless aura of most cocktail lounges, Hide is bright and open, with a fresh herb garden growing behind the bar. Reasonably priced bar bites and happy hours mean it’s a great stop for a post-work drink or a date night. Times Ten Cellar is warm and inviting with plush couches, candles throughout the space and all the hummus and cheese platters you can eat. Sign up for a tasting of one of the 31 wines—21 of which are locally produced. Although the food menu is pretty limited, Wednesday night is pie night, featuring Urban Crust’s mobile pizza oven and slices of Dallas' favorite bourbon pecan pie from Emporium Pies. As far as speakeasies go, Dallas is home to quite a few. Underground Midnight Rambler and faux candy shop Truth and Alibi, for example, offer prohibition-era inspired spaces with boozy cocktails appreciated by all sorts of drinkers. But High and Tight, helmed by owner Braxton Martin, goes a step further, offering jazz-era cocktails in the back and a great performance space in the front. Sip on a bold, creative concoction like the Zozzled—bourbon with a tart mix of apple, lemon, honey and ginger—while watching live performances in a dark, intimate stage room. Step into the warehouse of your childhood dreams. 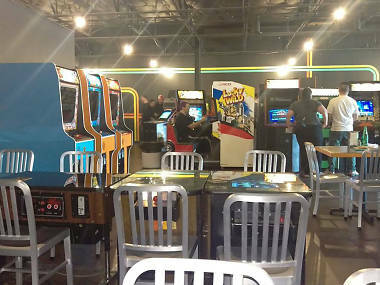 Rows of nostalgia-inducing video games such as Defender and Mortal Kombat beckon from a simple, industrial-style building in Richardson. Free Play Arcade offers more than 80 arcade games for a flat $10 entry fee. A rotating menu of craft beers (disappointingly not included in the $10 fee) will fuel your competitive spirit while The Simpsons rematches will keep the gaming rivalry alive. Built in 1911 and now effectively the oldest operating bar in Dallas, Sons of Hermann Hall has lived many lives: fraternal order house, bowling alley, concert venue, dance hall. Don’t let the old exterior dissuade you, though. On Wednesdays, several hundred (yes, hundred) guests gather to learn the basics of swing dance and show off their skills on the floors that carried bowlers several decades before. Don’t feel the need to bring a partner; guests of all skill levels are encouraged to join while indulging in typical bar offerings. Although not the usual go-to bar stop, Sons of Hermann Hall is a cornerstone of Dallas history and offers a different kind of entertainment for the adventurous guest.